Imagine that you are responsible for a Domino application where users can register themselves and you want to get notified about about new registrations as soon as possible. This can be done by sending an email message in WebQuerySave event or SMS message, but it has its disadvantages. Sending by email can give several minutes of delay, and receiving 20 SMS per hour can be annoying. Using Sametime messages for notification is not as disturbing as beeping SMS messages and also ensures instant delivery. One more way to see the latest registrations is to use a Sametime bot to get a quick overview of the latest registrations without opening the database in Notes client. Let's see how you can use tools provided by Botstation Technologies (all available as free trial) to accomplish these tasks. The recipient immediately gets a Sametime message showing registration details and can take an appropriate action if needed. You can download an evaluation version of the STAgent and try by yourself in your own agents. Instead of sending a Sametime message immediately after each registration, you can query Sametime Bot to get the new registrations since last the query time. 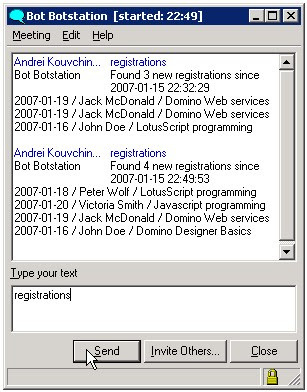 Sametime Bot from our company Botstation Technologies is able to run ordinary LotusScript agents, which makes it possible to accomplish this task in just 5 minutes. Same solution can be re-used later in similar applications. You can also restrict access to this particular bot functionality to only certain persons. To ask bot for new registrations, you simply choose bot from your buddy list and type "registrations" to him. Bot receives your message and immediately answers with a list of last registrations. To make this work, all you need to do is to create a LotusScript agent which searches for documents created after agent's last run time and then create a Question mapping in the bot's configuration database. To create a bot question which triggers an agent, you specify keywords (e.g. "registrations", "bookings") and choose an agent from a list of available agents. See the picture below. If col.count>0 Then tmp="Found "+Cstr(col.count)+" new registrations since"+Cstr(agent.LastRun)+"<br>"
tmp=tmp+coursedoc.CourseDate(0)+" / "+coursedoc.CreatedBy(0)+" / "+coursedoc.CourseName(0)+"<br>"
To emulate the real application, the bot in the demo application adds a random number of new documents (1-5) after each run. So every time you issue "registrations" command to bot, you will get some unique results.